More South San Diego notary services are defiantly needed. Over the past year more people have requested an Imperial Beach notary service on Google. From Imperial Beach I’ve seen a large increase in people searching the web for Imperial Beach notary, Coronado notary, San Ysidro notary and Chula Vista notary too. I thought there were lots of Imperial Beach notary services, but based on how far people are driving lately to visit my Imperial Beach notary office, who were looking for a notary public in Chula vista, or a notary in Coronado, or a notary in San Ysidro means there’s a need for more south bay notary services to give the Imperial Beach notary some healthy competition. Thinking of becoming an Imperial Beach notary? Now seems like a great time. 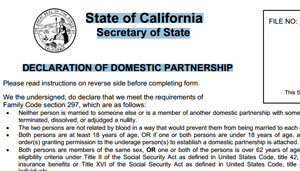 Just over the past week I’ve notarized loan refinance papers, new loan docs, Termination of Domestic Partnership, Authorization for Foreign Travel with Minor, Special Power of Attorney, out of state release of liability and a lot of retirement account loans and withdraws. Many of the withdraws are from military separation papers. Give us a call at 619-423-7172 if you need a Imperial Beach notary – or even close by – the Imperial Beach notary travel for an additional fee, if needed. No appointment is necessary however you can make an appointment Monday through Friday 9am to 6pm and Saturdays 10am to 2pm. We can travel to you too – for an additional fee. Car manufactures are funny about releasing new car models. This story “Ford’s Master Of Disguise Keeps Latest Models Undercover from All Things Considered on NPR is another great example. Foam masked Mustang, BMW and Mini’s looking like garbage bags wrapped in duct tape. Really? Good thing new car insurance isn’t so hard to find! New and experienced drivers with good, bad and ugly driving records can see and compare countless auto and truck insurance companies and see offers for endless payment options using our online new – and used – car insurance rater. Manufactured homes make up about 10 percent of the total housing in the United States. They need to be protected. Ideal Choice Insurance Agency can help you find the right mobile home insurance for you. Modular homes are pre-fabricated homes that are transported in pieces and assembled to a permanent foundation by contractors. Mobile or manufactured homes are completely constructed prior to transport. They are welded to a permanent steel chassis so that they can be towed to the home site and not attached to a permanent foundation. In Mobile Home Parks Preferred and non-preferred parks may be quoted online here. 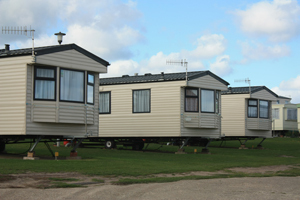 On Private Property mobile homes sometimes find it difficult to find affordable low priced insurance to cover the home, we offer coverage for all zones, even commercial usage! Home and structure protection, which compensates for repair damage as a result of: fire, storms, burglary or vandalism. Damage or loss of personal possessions is covered by personal property protection. Guest medical protection will cover the medical expenses incurred if a guest is injured in your home. Additional living costs will reimburse if you are ever in need of temporary housing. As a mobile home owner, it is crucial to protect your home. Ideal Choice Insurance online LiveRate can help you compare policies, answer your questions or concerns to buy the right policy for your needs and budget. Click here or call us today at (619) 423-7271 or (877) 739-0182 to speak with an agent. Norman Park Center in partnership with AARP is offering Driver Safety Classes for seniors. Classes are held from 12pm-4pm for a fee of $20 per month on the following dates: Feb 5 & 19 and March 5 & 19. NOTE: You must attend both classes offered that month. Tea and History talk on Thursday, Jan 23 at 10:30am. Join us for a lovely morning as we sip tea while learning more about the history of Chula Vista and the new Historical Society of South Bay. Looking to get outside and get more exercise while making friends and meeting new people? Join the Norman Park Senior Center staff and volunteers on Tuesday and Wednesday mornings at 9:15am to explore the local neighborhoods, sights and sound by foot. All walking levels are welcome and the class is free. Beginning Zumba is now being offered at Norman Park Center located at 270 F street on Mondays 5-5:50pm, 6-6:50pm and Tuesdays 6-6:50pm. The drop in fee is $1 per class for seniors and $2 per class for all other adults. Join the Chula Vista Senior Club for a Potluck and Bingo on January 24th 12pm-2pm at Norman Park Center. Bingo cards are 50 cents each with prizes given out to winners. Bring a potluck dish of your choice to share with the group. 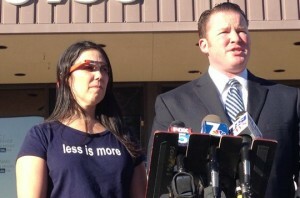 Cecelia Abadie, left, with her attorney, William Concidine, talks to media after charges against the motorist for wearing Google Glass while driving were dismissed in San Diego County traffic court on January 16, 2014. A San Diego traffic court judge on Thursday dismissed a citation received by Temecula woman in October for wearing Google Glass while driving in what’s believed to be the first case of its kind. Commissioner John Blair found that Cecilia Abadie, though wearing the high-tech glasses, was not actively using them when she was pulled over by a California Highway Patrol officer, accused of speeding on Interstate 15 on Oct. 29. The judge also dismissed the speeding ticket because of a lack of evidence. Google Glass is the Silicon Valley Internet giant’s experiment with wearable computing. The $1,500 eyeglasses are being tested by about 10,000 people nationwide. They’re expected to become available to the general public sometime this year. Google Glass links to the Internet wirelessly via Bluetooth. Using a small screen above the right eye, the glasses respond to voice commands and can perform tasks such as checking email or airline flight times. Learn from local experts on how to protect yourself from fraud, identity theft and more on Wednesday, January 29, from 10-11 a.m. A Fraud and Scam Awareness presentation will be held at the Norman Park Center, 270 F Street, Chula Vista. The event is free and open to the public. This interactive presentation will include handouts, and many additional resources. For more information, please call (619) 409-1930. Guest speakers include Detective Padilla from the Chula Vista Police Department Property Crimes Unit, and Anabel Kuykendall from Aging & Independence Services. an employee who does not own a car but drives a company provided car at work and is required to have a personal policy, even though the employer’s business coverage will be primary and business use may be excluded from the employee’s policy. BORROWING A CAR – If you don’t own a car but occasionally borrow a car from a friend the non- owners policy may be a fit. Covered damages that are incurred while driving a borrowed car will typically be subject to primary coverage through the auto policy of the vehicle owner and the policy for a non-owner will provide excess or supplemental insurance. If the owner of the vehicle does not have insurance on the vehicle the non-owners coverage will provide primary coverage. Insurance companies will not issue a non-owners policy for a driver who uses a car owned by or available for regular use by either the policyholder or a member of the household. Non-owners insurance generally covers liability only which protects the policyholder up to the policy limits if they are at fault for injuries and property damage to others. These policies typically do not include comprehensive, collision, and rental coverage. SR22 – A non-owners insurance policy may be a good fit for people who need an SR22 filing to reinstate their suspended or revoked license and prove that they have met the state insurance financial responsibility requirements. They may not be able to get an owners insurance policy if they don’t own a vehicle and therefore cannot get their license reinstated since they don’t have insurance. Non-owners policies will normally resolve this dilemma since it will satisfy the financial responsibility requirements of the state and enable the insured to obtain an SR-22. It is important to remember that a non-owners policy provides very limited coverage and only covers the named insured when that person is driving an automobile that is not available for regular use and in which the insured has no ownership interest. Any coverage afforded is for the named insured and does not include or extend to any other person, including family members. ﻿ CMS development with Incode Group on schedule.